by Chris Woodford. Last updated: August 11, 2018. You may have only a fraction of a second to catch a vital photograph, but what if it's too dark to see? Flash lamps, filled with a gas called xenon, are the answer. Press the button on your camera, wait a few moments for the flash to charge, hit the shutter button to take your picture and—CRACK!—you suddenly have all the light you need. You'll also find xenon lamps powering movie projectors, lighthouses, and ultra-bright car headlamps. What exactly are xenon lamps and how do they work? They're examples of what we call arc lamps and they work in a very different way to ordinary lamps. Let's take a closer look! Photo: Lighthouse lamp: It takes an extremely bright light to throw a beam miles out to sea, even with the help of a powerful Fresnel lens (the concentric circles you can see in the background). That's why many lighthouses are powered by super-bright xenon lamps. Photo by Gary Nichols courtesy of US Navy. How do arc lamps work? All lamps make light, but they don't all work the same way. Incandescent lamps (our traditional household lights) make light by passing electricity through a thin metal filament (wire), so it gets really hot and burns brightly. Fluorescent lamps are very different: they zap electricity through a gas to make invisible ultraviolet light, which gets converted into light we can see (visible light) when it passes through the white inner coating of the lamp's glass tube, making it glow brightly (or fluoresce). Like neon lamps, xenon lamps are examples of arc lamps. An arc lamp is a bit like a small bolt of lightning happening under very controlled conditions inside a glass tube filled with a gas under either very low or very high pressure (depending on the type of lamp). 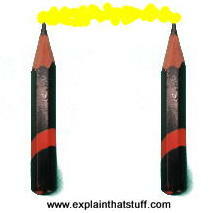 At the two ends of the tube there are metal contacts called electrodes, connected to a high-voltage power supply. Where does the light come from? When the power supply is turned on, the gas atoms suddenly find themselves under incredible, electrical force and split into smaller parts. This is called ionization (or ionizing the gas). The broken bits of atoms (positively charged ions and negatively charged electrons) then hurtle in opposite directions along the tube, with electrons rushing to the positive electrode and ions going the other way, forming an electric current. The ions and electrodes crash into one another and into the electrodes, giving off energy as a flash of light called an arc that effectively leaps the gap between the electrodes—just like a lightning bolt. This is an example of an electric discharge, which is why lamps light this are also called discharge lamps. More light is produced by the electrodes themselves, which become incredibly hot and burn brightly in the process. Temperatures of over 3000°C or 5400°F are typical, which is why the electrodes are generally made of tungsten, the metal with the highest melting point (approximately 3400°C or 6200°F). The color of the light depends on the atomic structure of the gas that's used (we explain this in more detail in our article on neon lamps). In a neon lamp, the light produced is red; in a mercury lamp, it's a colder and bluer light; in a xenon lamp, it's a much whiter light not that different from natural daylight (sunlight). 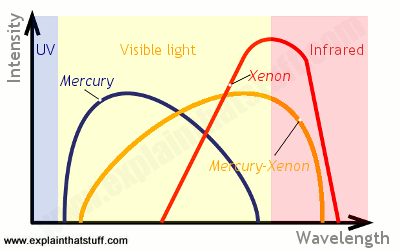 In mercury-xenon lamps, xenon and mercury work together to produce a more even light spectrum across a wider range of wavelengths. Artwork: How three different types of arc lamp produce three different colors of light (patterns of wavelengths). Mercury produces a bluer light (shorter wavelengths) and some invisible ultraviolet, while xenon makes more natural and even visible light (and quite a bit of invisible infrared). As you would expect, mercury-xenon lamps produce a compromise, balanced across a wider range of wavelengths. Photo: The basic concept of the arc lamp. An electric discharge passes between two carbon electrodes, giving off light. Strictly speaking, we use the term arc lamp to mean one, particular type of arc lamp with carbon electrodes and air in between them. Before Edison, Swan, and their contemporaries perfected the incandescent lamp, arc lamps like this were really the only type of electric light available. They were invented in 1807 (about 70 years before Edison perfected his lamp) by British chemist Sir Humphry Davy (1778–1829). Davy found he could make electric light by connecting two carbon electrodes (a bit like pencils) to a high-voltage power supply. Initially, he kept the electrodes touching one another. Gradually, as he moved them apart, he found an arch-shaped beam of light spanning the gap between them—which is how "arc" lamps got their name. Arc lamps weren't very practical: they needed huge electric current to make them work and the high temperature of the arc quickly burned the carbon electrodes away in the air. "Huge" electric current is no exaggeration: Davy had to use a battery with 2000 separate cells to make a 10cm (4-inch) arc. Modern incandescent lamps developed when arc lamps were improved in two ways. 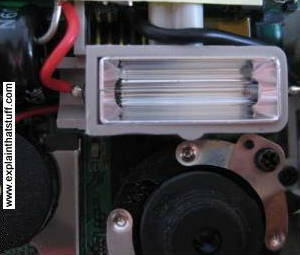 The air gap was replaced by a filament, so lower voltages and currents could be used. The whole lamp was also sealed inside a glass bulb filled with a noble gas to prevent the filament from burning up in the air's oxygen. That made the lamp last very much longer. What are the different kinds of xenon lamps? Xenon lamps come in two broadly different types: ones that make light continually and ones that flash. Photo: Here's a very small xenon flash lamp from inside a digital camera. The black and red wires connect the two electrodes at opposite ends of the lamp to a large electrolytic capacitor (which is the black cylinder you can just see on the top left of the photo). The camera lens is the black circle underneath the flash. In xenon photographic flash lamps, the light is literally a flash: it lasts anything from a microsecond (one millionth of a second) to about a twentieth of a second (there's no real need for it to last any longer since it only takes this long to capture a photo) and it's around 10–100 times brighter than the light from an ordinary incandescent lamp. One way to produce such a bright flash would be to use a very high voltage power supply, but that's not typically available in something as small and portable as a camera. Instead, cameras use a large capacitor (a device for storing electricity temporarily). Its job is to build up a high-voltage charge big enough to make a discharge in the flash tube using only the camera's puny, low-voltage batteries. That takes time—which is why you often have to wait a few seconds to take a flash photo. Once the flash has happened, the xenon in the tube returns to its original, nonconducting state. If you want to take another flash photo, you have to wait for the capacitor to charge up again so the whole process can be repeated. Artwork: How Harold Edgerton's flash lamp worked. For the sake of simplicity, I've just picked out a few of the key components here. The glass lamp (red, left, 92) is surrounded by a polished reflector to concentrate its light on the thing you've photographing (gray, left, 25). It contains a xenon flash tube (yellow, 18) activated by electrodes (green, 94), tripped by a vacuum tube (purple, 1), and powered by a capacitor (blue, middle, 11), which Edgerton suggested might be about 28μF charged to about 2000 volts. The flash lamp can be powered either by a traditional outlet (turqouise, right, 71) or a portable battery (dark green, bottom, 69). These feed into a transformer (orange, 45), which produces the high voltage needed to charge the capacitor. The lamp can be triggered automatically by the camera shutter (grey, left, 66) or manually by a push button just to the right (51). Artwork from US Patent 2,358,796: Flash photography by Harold Edgerton courtesy of US Patent and Trademark Office. Other kinds of xenon lamps work more like neon lamps and produce smaller amounts of light continually. Instead of passing a huge amount of electricity through the gas very briefly to produce a sudden "arc" of light, they use smaller, steadier voltages to produce a constant discharge of bright light. Movie-projector lamps and lighthouse lamps work in this way. Xenon HID (high-intensity discharge) headlamps use relatively small bulbs with a tiny arc gap between their electrodes (as small as 2mm or 0.1in). Invented by Philips in the early 1990s, they claim to "put 50 percent more light on the road," producing both a whiter and brighter light than standard headlamps. HID lights are also more efficient, producing more light from a lower wattage bulb. Since they're smaller, they allow designers more flexibility to style the front end of a car more aerodynamically, which can lead to much better fuel economy. As for drawbacks, they do produce some ultraviolet light, and they need built-in filters to stop this from damaging the lamp's components. Like fluorescent lamps, HID lamps also need a device called a ballast, a compact electronic circuit that provides the high startup voltage to create the initial arc in the lamp, then regulates the current to maintain the arc at a steady brightness after that. Unfortunately, bright headlamps that work well for you may not work quite so well for other drivers, if they cause dazzle and glare. That's why HID lights are not legal in all countries/states. In some countries, they are legal only if they are installed in the correct way (for example, as "original equipment" by the car manufacturer), not retrofitted (as an add-on kit), and if they are "self-leveling" (which means they're automatically adjusted to compensate for bumps so they keep pointing down at the road). Artwork: A typical Xenon HID headlamp from an early 1990s design by General Electric. 1) Tube made of quartz or fused silica; 2,3) Necked portions of tube made by heating and surface tension; 4,5) Pinlike tungsten electrodes; 6,7) Molybdenum inleads. 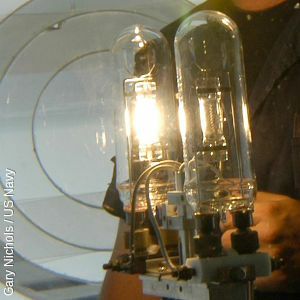 The tube contains a mixture of mercury, metal halides, and xenon gas, and the electrode gap is roughly 2–3mm. Artwork, courtesy of US Patent and Trademark Office, from US Patent 5,121,034: Acoustic resonance operation of xenon-metal halide lamps. 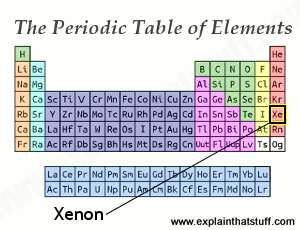 Artwork: The periodic table of chemical elements showing the position of xenon. Notice how it's over on the right with the noble gases and toward the bottom of group 18. That tells you that xenon atoms are relatively heavy, which is why xenon gas is heavier than air. You've heard of neon? Xenon is similar. Helium, neon, argon, krypton, xenon, and radon are the chemical elements from the part of the periodic table that we call the noble gases (once called the "inert gases" because they don't really react that well with other elements). If you think back to your school chemistry, the noble gases are the elements down the column on the extreme right. What's xenon like? It has no color, taste, or smell, but it is present in the air around us in minutely small quantities—roughly one molecule of xenon for every 20 million molecules of other gases. Xenon atoms have an atomic number of 54 (much heavier than oxygen or nitrogen atoms), so xenon gas is about 4½ times heavier than air: if you're hunting for xenon, look near the ground! Xenon is a gas on Earth because it melts at roughly −111°C (−168°F) and boils at −107°C (−161°F). "The discovery of an entirely new group of elements, of which no single representative had been known with any certainty, is something utterly unique in the history of chemistry, being intrinsically an advance in science of peculiar significance. The more remarkable is this advance when we recollect that all these elements are components of the atmosphere of the earth, and that, though apparently so accessible for scientific research, they have for so long a time baffled the acumen of eminent scientists..."
Quoted from Presentation Speech by Professor J.E. Cederblom, President of the Royal Swedish Academy of Sciences, on December 10, 1904. Sir William Ramsay: His Life and Works: An online biography from University College London, England where Ramsay was professor of chemistry. 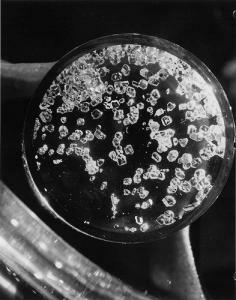 Photo: "Hmmm, maybe xenon is not so unreactive after all?" That's what chemists John Malm, Henry Selig and Howard Claassen from Argonne National Laboratory concluded in October 1962 when they successfully produced these sparkling, square crystals of xenon tetrafluoride—the first simple, manmade compound of xenon ever produced. One of Malm's favorite jokes was that chemists would hang up their lab coats the day someone discovered a solid compound of a noble gas—exactly what he and his colleagues achieved. Photo by courtesy of Argonne National Laboratory published on Flickr under a Creative Commons Licence. Halogens and Noble Gases by Monica Halka and Brian Nordstrom. Infobase/Facts on File, 2010. A 157-page overview suitable for teenagers and adults. Includes a short (10-page) chapter on krypton and xenon. Chemical Achievers: The Human Face of the Chemical Sciences by Mary Ellen Bowden. Chemical Heritage Foundation, 1997. The human stories behind great chemical discoveries, including William Ramsay's work on the noble gases. The Noble Gases by Adam Furgang. Rosen Group, 2010. A simple 48-page guide to helium, neon, argon, krypton, xenon, and radon for ages 9–12. Noble Gases by Jens Thomas. Benchmark Books, 2002. A shorter book describing the properties of noble gases, how they're prepared, and how they're used in lighting, medicine, and elsewhere. Laser Cinema, Coming Someday to a Theater Near You—Maybe by Monica Heger, IEEE Spectrum, October 1, 2008. Lasers could make xenon-lamp movie projectors obsolete, if only they could be made more cheaply. Fluorescent lamps go green: BBC News, January 29, 1999. How xenon gas can be used to make more environmentally friendly fluorescent tube lamps. US Patent 5,884,104: Compact camera flash unit by Scott B. Chase and Carl F. Leidig, Eastman Kodak Co , March 16, 1999. A typical flash unit from a modern camera. US Patent 5,121,034: Acoustic resonance operation of xenon-metal halide lamps by Gary R. Allen et al, General Electric, June 9, 1992. An early patent covering HIDs in car headlamps. US Patent 4,904,907: Ballast circuit for metal halide lamp by Joseph M. Allison et al, General Electric, February 27, 1990. This is a closely related patent that explores the design of the ballast. US Patent 2,358,796: Flash photography by Harold Eugene Edgerton, September 26, 1944. 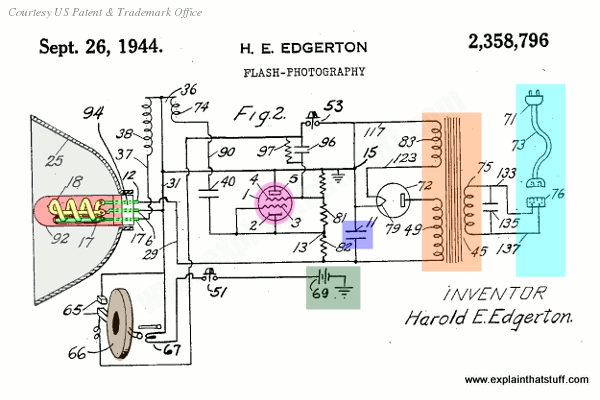 Edgerton's original flash patent.